Even though they’re fairly uniform on the outside, shipping containers can accommodate the full spectrum of onsite, energy production activities—from sleeping and eating, to working and storing valuable equipment. In fact, oil and gas companies are now discovering how versatile these steel-framed structures can be, as we help them stack, join, modify, and relocate more man camp units. 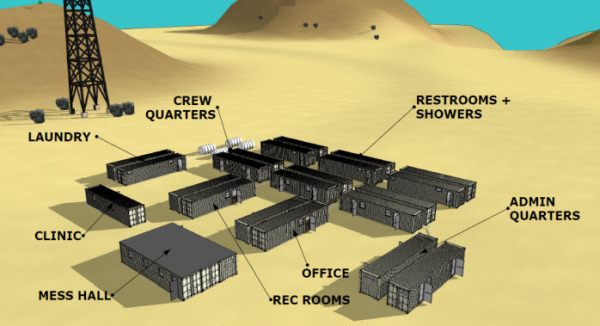 How are shipping containers used to create man camps and oilfield villages? Shared or independent living units. Recreation rooms and fitness centers. Why are shipping containers ideal for oil and gas man camps? Falcon Structures can modify shipping containers to suit the environment of your job site. Often, container structures require no foundation, compressing your field camp deployment time. They are are transportable via truck, meaning your business can relocate the camp without reinvesting in new structures for each job site. 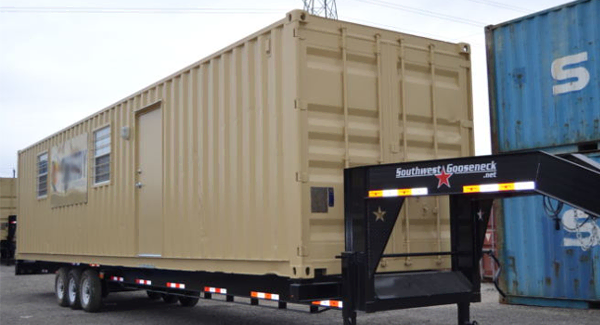 Our team of designers and engineers can further optimize containers for your man camp operations by adding in standard or specific features. Blog: Should I Use Porta-Potties or Shipping Container Bathrooms? If you have any questions, contact us at 877-704-0177 or sales@falconstructures.com.